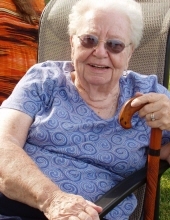 Her Legacy… Martha Anna “Sally” Tobias, Age 89, passed away April 3, 2019. She was born on March 25, 1930, in Beaver Falls, Pennsylvania to James and Ida (Pudder) Devine. Sally married the love of her life, Joe Tobias April 11, 1953 in Ida, Michigan. Sally was a baker for the University of Michigan, retiring in December of 1986. She was involved for many years with Junior Farm Bureau and 4-H. Sally was an avid University of Michigan fan, loved gardening, “strawberry picking and green bean snapping” and of course baking for her beloved family. She will be missed by all who knew and loved her. Her Family… Sally will be missed by her children Anna (Earl Reimold) Tobias of Belleville, Michigan, Joel (Karen) Tobias of Manchester, Michigan, Cathy Tobias of Cool, California and Mary Murdock of Britton, Michigan; her sister Francis (Cecil) Danzeinsen of Temperance, many grandchildren and great grandchildren. She is preceded in death by her parents, husband Joe, infant son Jimmy and two brother’s Robert and James Devine. Her Farewell… Sally’s family and friends will gather Friday, May 10, 2019 from 10:00 am until noon at Borek Jennings Funeral Home, Manchester Chapel where her Farewell will be held at 12:00 pm (noon). Deacon Chris Vida will serve as Celebrant. Please leave a message of comfort for Sally’s family at 1-877-231-7900, or sign her guestbook at www.borekjennings.com. To send flowers or a remembrance gift to the family of Martha "Sally" Tobias, please visit our Tribute Store. Guaranteed delivery before Martha's family and friends gathering begins. Guaranteed delivery before Martha's community farewell service begins. "Email Address" would like to share the life celebration of Martha "Sally" Tobias. Click on the "link" to go to share a favorite memory or leave a condolence message for the family.